We have all seen it countless times before: visual confirmation that without the Fed’s (and all other central banks’) liquidity pump, the S&P would be about 70% lower than were it is now. The recovery from the lows after Bullard spoke yesterday is another reminder how addicted markets still are to liquidity. Indeed in today’s pdf we reprint and update a table from our 2014 Outlook showing the various phases of the Fed’s balance sheet expansion and pausing over the last 5-6 years and its impact on equities and credit. We have found that the relationship broadly works best with markets pricing in the Fed balance sheet move just under 3 months in advance. 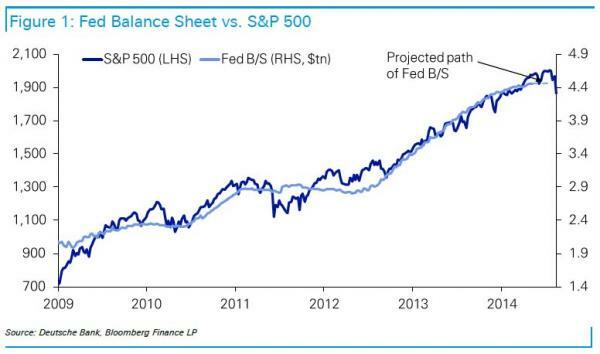 We’ve also included our oft-used chart of the Fed balance sheet vs the S&P 500 to help demonstrate this. So end July / early August 2014 was always the time that this relationship suggested markets should enter a new more difficult phase. So we still think central bankers hold the key to markets going forward and there seems to be a hint of change in the Fed. 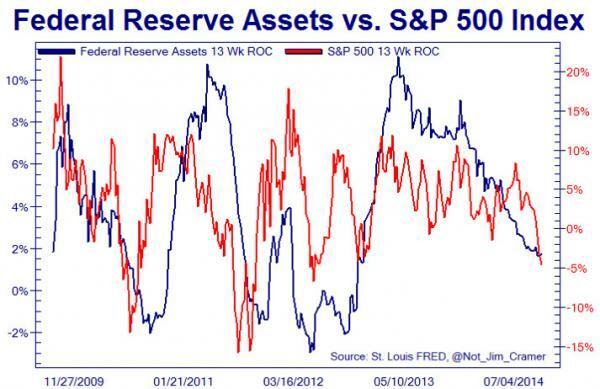 Another view was shown over the weekend, in “The Chart That Explains Why Fed’s Bullard Wants To Restart The QE Flow” which shows that when the Fed’s excess reserve firehose is turned on Max, stocks surge; when it isn’t – as has been the case recently – they tumble. We think the markets’ weakness owes more to an almost belated reaction to a temporary lull in central bank stimulus than it does to any reduction in the effect of that stimulus in propping up asset prices. 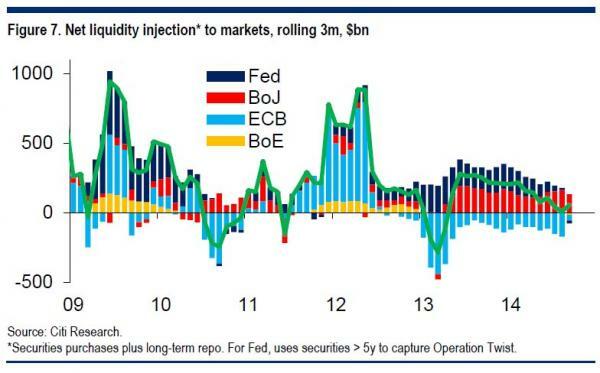 Figure 5 shows the rolling 3m combined liquidity injection by the Fed, the ECB, the BoE and the BoJ, plotted against the rolling 3m change in spreads. While the relationship is not perfect – liquidity flows across asset classes and across borders, and there are announcement and confidence effects in addition to the straightforward impact on net supply – it is this, not fundamentals, which we would argue has been the major driver of markets for the past few years (Figure 6 shows the same series plotted against global equities). For over a year now, central banks have quietly being reducing their support. As Figure 7 shows, much of this is down to the Fed, but the contraction in the ECB’s balance sheet has also been significant. Seen from this perspective, a negative reaction in markets was long overdue: very roughly, the charts suggest that zero stimulus would be consistent with 50bp widening in investment grade, or a little over a ten percent quarterly drop in equities. Put differently, it takes around $200bn per quarter just to keep markets from selling off. If anyone ever needed any confirmation of what we said in June 2012, that “The Stock Is Dead, Long-Live The Flow: Perpetual QE Has Arrived“, now you have it, and only qualified but quantified. Because to translate what Matt King – Citi’s most respected strategist and the only person on Wall Street to warn about the Lehman collapse and its consequences before it happened, just said – if and when the global central bank liquidity tracker ever drops to $200 billion per quarter or less, the market will crash.